We just shipped out a new order of signed books to Yarn Therapy in Tallahassee, FL. It is always nice to connect with Local Yarn Shops around the country, and we love to see photos of projects from our books, too! 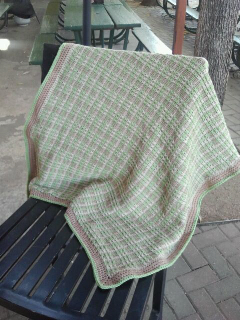 Glen created this beautiful version of Freddie's Blanket, and added a contrast color crocheted border to the edges. I wonder who the lucky recipient will be? Thank you, Yarn Therapy, for sharing this photo with us! Its for my sister's first kid, and my first niece/ nephew. I'm also working on Freddie and Mae. I saw the pattern and book at Yarn Barn in San Antonio, Texas. I immediately called my cohorts at Yarn Therapy in Tallahassee, Florida and they got hooked too! Its an awesome easy blanket!!! Thanks for sharing more about your project, Glen! All three of our children have a very special favorite blanket, and I am sure your niece/nephew will love this one just as much! I just love slip-stitch colorwork, such a fun technique! Happy Stitching!